Commonwealth bronze medallist Zoe Smith is "gutted" after having her personal Olympic funding suspended by British Weight Lifting for being overweight. The governing body is disciplining the 16-year-old because officials say she has "lacked commitment". Performance manager Fiona Lothian said: "Zoe is an amazing talent but any athlete still has to work hard to realise their true potential. Smith responded: "I am gutted after everything I've achieved this year." The London-born teenager has broken more than 300 weightlifting records since switching from gymnastics four years ago. She claimed silver at the European Youth Championships in June and followed that in October by winning the first weightlifting medal by a British woman, at the Commonwealth Games in Delhi. "I am a 16-year-old girl and have to balance the pressures of school and my life away from weightlifting with training and competition," she added. "I will just carry on working hard as I always have to prove to [the governing body] that you just can't have the success that I have had through talent alone." 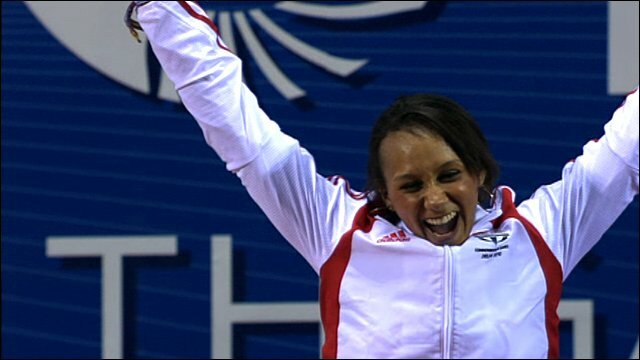 She is a medal prospect for the 2012 Olympics but coaches at British Weight Lifting have become concerned at her "lack of commitment" and say they have taken this step in an attempt to get her training back on track. Her personal funding will be withdrawn until "at least the end of January" although she will still receive support in the form of physiotherapy and nutritional guidance. "For Zoe it's not about the money, it's always about the performances," Smith's agent Gab Stone told BBC Sport. "Losing the funding won't be life changing but if she feels she isn't getting the support that she needs then my great fear is that one of the countries next sporting superstars could be lost. Smith was expected to compete at the European Junior Championships in Cyprus, in November, but the governing body says she arrived at a pre-competition training camp overweight and without a training programme. British Weight Lifting made the decision that they "could not continue to support an athlete who was not committed to following a structured training programme or ensure they stabilised their body weight" and therefore the teenager was not entered. The Londoner has been competing predominantly in the 58kg category but has admitted that she struggles to keep to that weight. Smith needed to lose 5kg in the 10 weeks leading up to the Commonwealth Games and has been tipped to step up to the 63kg division in the future. "On World Class Programmes, athletes are funded not only because they are good, but because they are willing to work hard to become even better," added Lothian. Smith has been ordered by British Weight Lifting to commit to five training sessions per week, each at least 90 minutes in length and work with nutritionists to ensure she reaches optimal body weight and conditioning ahead of the Tri-Nations Tournament in Norway on 12 February 2011. Should she meet the agreed criteria, the Londoner's funding could be reinstated after the completion of the competition. Smith's main focus for 2011 is likely to be the World Championships in Paris in November, a key qualifier for the London Olympics. What makes Zoe Smith special?